I have three teenagers, all of whom used to adore school. They would jump out of bed, happily come downstairs, have a nice breakfast, kiss me goodbye and run off to the bus. Well, at some point, they turned into cave dwellers. People that don’t happily do anything, especially when it comes to mornings. Or school. Or being awake. Somehow, I’m expected to haul them out of bed, make sure they’re dressed and fed in a matter of minutes. Somehow. I’ve tried the set their clothes out the night before, set an alarm, pack their bag early, etc, etc. I’ve tried it all and have had little to no success as they know how a snooze button works. Mornings around here are filled with whining, nagging, searching for things, and running out the door with no breakfast and a bad attitude. My little cave people seem to thrive on chaos and it makes me crazy. I’ve finally given up on most of it, and just let them deal with themselves. If their clothes match, and all the “bits” are appropriately covered, I consider it a success. If they get to school and realize that they forgot their homework or their lunch, that’s their problem. But, I still feel it’s my parental duty to get some kind of food into their body, even if I have to throw it at them as they sprint out the door. Thankfully, I found an awesome breakfast for on the go. 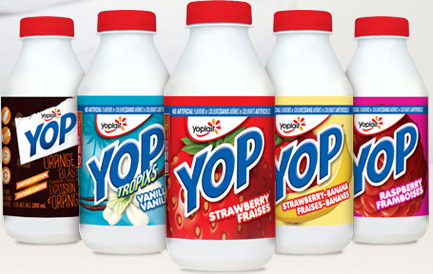 Yoplait YOP, drinkable yogurt. It’s nutritious and filling and they actually like it. I like that I know that they’re actually getting something filled with vitamins and nutrients, and that they’re not starting their day with empty bellies. I’ve never been able to get them to eat yogurt because of all the “chunks and stuff” but they all love YOP, because it’s smooth and tasty. (Their words, not mine). I think they may also love it because once the bottle is empty, you can squeeze the container and shoot the lid across the bus, but I could be wrong. So as they’re complaining and fighting and running for the bus, you can guarantee that someone will yell, “Gimme YOP, me Mama”. And I’ll be there ready to chuck one at their heads. Oh the joys of teenagers. If you want to give my “crazy morning guilt reliever” a try, check out the Life Made Delicious Facebook page and get yourself a coupon for a free Yoplait YOP (while supplies last, going fast). You and your kids will love it. Disclosure – I am participating in the Help YOP Help You Blogger Campaign by Mom Central Canada. Compensation was received as a thank you for participating and for sharing my honest opinion. The opinions on this blog are those of the author’s. As a wife, mother, foster parent and multiple business owner, April’s wit and humour have carried her through circumstances most will never endure. Her insights challenge our thought processes and her drive to create a better world inspires those she influences to join her on that quest. She is also the voice of “This Mom’s got Something to Say”, and “Ask April” at Edmonton Child’s magazine. This is fantastic and makes me look so much forward to ten years from now. 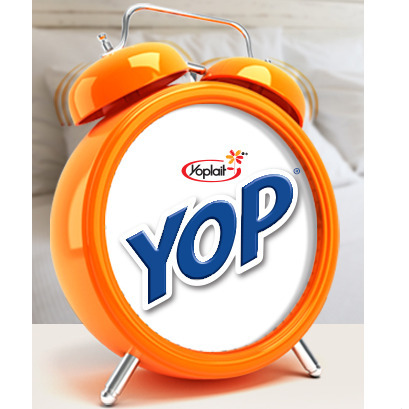 At least I get to throw Yop at their heads (; Thanks for the morning laughs!